Sending appointment reminders are important in ensuring that your clients are reminded of their upcoming appointment, whether it is an individual consultation or a group class. Using our automatic Email or SMS reminders system means that once you have set it up to your liking, you sit back and relax knowing that Clients will receive their reminders. When setting up Campaigns, it is easy to send the same message to all Clients attending their appointments across all Locations with all Practitioners, or to select specific Locations/Services/Practitioners to send more personalised messages. If you provide Services and Classes, you will need at least 2 different campaigns as the same campaign can only be used for either Services or Classes, not both. There are two ways to send appointment reminders: Email or SMS. Emails reminders are free of charge but SMS reminders have fees so, if you choose to send SMS reminders, make sure you have enough SMS Credits in your account (Practice > Subscription > SMS Credits). Whether you use Email or SMS, make sure your clients have their consent boxes ticked for SMS Reminders, Email Reminders or both, otherwise they won’t receive scheduled messages. 2. 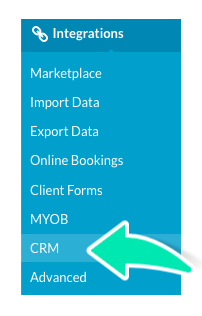 Click CRM under Integrations. 3. Click Create Campaign in the bottom right corner. 4. Add a Title to easily recognise your message. 5. In type, select Send Reminder Messages. This section covers how to configure which clients receive which reminders. 7. Select if Services or Classes attendees will receive the messages. 8. Choose which Classes or Services are included (All or a Selection – select which ones). 9. Choose for which Locations the message is sent (All or a Selection – select which ones). 10. Choose for which Practitioners the message is sent (All or a Selection – select which ones). 12. Select how long before the appointment the message will be sent. Set a Number of Days, Weeks or Months. 13. Select which day of the week should the message be sent, Every Day or Specific Days. If you choose Specific Days, tick the boxes of the day the message will be sent, not the day of the appointments. 14. Choose at what Time of the day the messages will be queued to be sent. 16. Choose the Type of message, SMS or Email. 17. Type the Message, and click on Client, Appointment or Location to add placeholders that will be replaced by the personalised information when sending the message. Use the Placeholders to customise the message for each Client, Appointment, and Location. 18. Add a Subject (email only). 19. Review your Campaign and click Save. Once saved, the Campaign will be displayed in the list of Campaigns and can be edited or made inactive at a later time.